If you judge your books by their covers you’d not be inclined to give this German turntable a second glance. The STST Motus II looks like yet another solid plinth design with a medium mass platter and some nice woodwork. The deck is a bit chunkier than most, but is otherwise devoid of any hint at what lies beneath. I could be wrong, but there can’t be many other turntables around that combine the technologies hidden within this one, for the Motus II has both direct drive and a suspended subchassis. I knew you’d be surprised! The plinth that you see is effectively only a cover. It hides the complex internal workings and keeps the dust out; neither the arm nor the platter are fixed to it, and set up involves removing it altogether. The plinth/cover is also the only part that’s made of wood; you can have a variety of attractive veneers and a contrasting or matching top plate. It’s attractively discreet by the oil rig standards of some turntables. The workings underneath are pretty unusual to say the least, as the illustration hopefully reveals the subchassis is supported at three points, but what’s harder to see is that each of these points contains an adjustable leaf spring that provides a degree of damped isolation. I recall that Pink Triangle used leaf springs back in the 1980s, but not like these. This is not box-bound thinking. The brass weights on the subchassis act to counterbalance the tonearm which is supported on the large tubular section at the opposite end, the weights can be changed and moved to suit different tonearms. 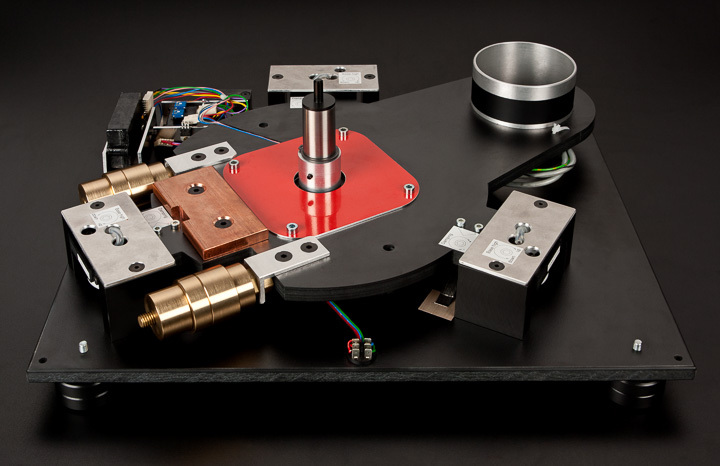 Importer Pure Audio is run by Guy Sargeant, formerly of Voyd turntables (a three motor suspended design), and he has found that the Motus II works well with SME, Fidelity Research, and Alphason arms, but unsurprisingly recommends STST’s own arm – specifically the Vertex with which this turntable was supplied. The direct drive motor on the Motus II was developed by company founder Stefan Strohmetz and differs from the type found on DJ oriented turntables by virtue of having very low torque. We in fidelity-appreciating circles do not need our turntables to get up to speed in a tenth of a revolution, so there’s no need to have loads of power available that will inevitably dissipate energy into the platter and undermine the cartridge’s ability to accurately trace the groove. The appeal of direct drive is that you eliminate the potential speed variations that a drive belt can introduce, but the drawback is that you have a motor attached firmly to the platter and that any extraneous vibrations it produces will get to the platter and thence the vinyl. By using a low torque motor and a six kilo platter to provide inertia, STST is doing its best to minimise unwanted energy transfer and damping it with a Delrin platter, which is a relatively soft plastic compared to acrylic.